The DSCOVR (Deep Space Climate Observatory) satellite was launched a few hours ago on a SpaceX Falcon 9 rocket from the Space Launch Complex 40 (SLC-40) at Cape Canaveral. The spacecraft successfully separated from the rocket’s last stage after about half an hour and inserted in the trajectory that will bring it to its destination. It also deployed its solar panels and sent the first signals, confirming that it’s working properly. DSCOVR will be placed in an area called L1, about a half million kilometers (about 930,000 miles) from Earth, where the planet and the Sun’s gravity are balanced. There it will begin its mission of observation of the solar wind after the test period, that will last about 40 days. The DSCOVR satellite had a troubled history. The original idea behind this mission arrived by then-Vice President Al Gore, who wanted to launch into space a satellite that would provide an almost continuous view of the Earth to be transmitted via the Internet. NASA integrated the idea in a mission that was called Triana after Rodrigo de Triana, the lookout in Christopher Columbus’s crew who sighted America. To a telescope for the Earth’s observations they added other instruments to measure how much sunlight was reflected by the Earth and the solar energy that reached the planet. The Triana satellite was built and was supposed to be launched on a Space Shuttle. The unofficial name GoreSat was given by Republicans as a mockery of a mission they considered a waste of money. The consequence was that the change of administration that followed the election of George W. Bush led to the cancellation of that mission. For years, the Triana satellite remained in storage until NOAA (National Oceanic and Atmospheric Administration) asked NASA to build a satellite to observe solar wind. So far, the ACE (Advanced Composition Explorer) satellite did this job after being launched in 1997 but it far outlived its original five years mission. It was a stroke of luck that the Triana satellite had the right instruments for NOAA’s needs so it was pulled out of storage, assembled and refurbished. With the new name DSCOVR, it was prepared for a mission a little different from the original, to observe solar wind. From its position, it will be able to identify dangerous solar storms and measure the energy that reaches the Earth. The US Air Force participates in the mission supervising the launch. 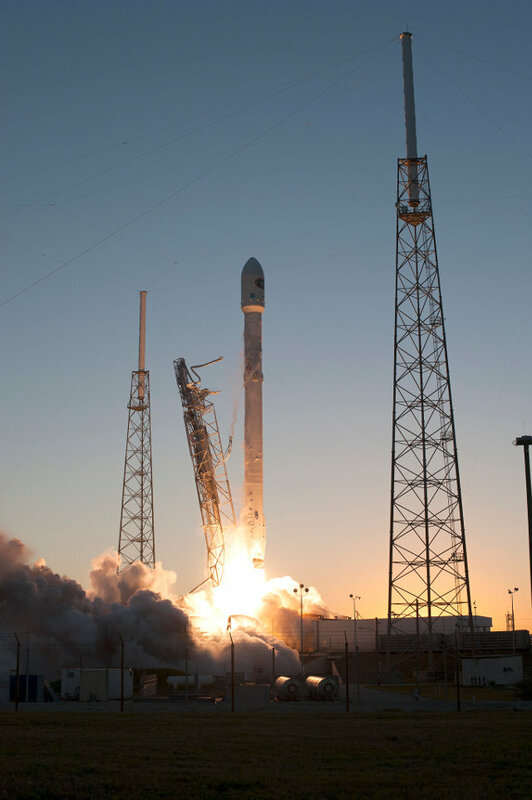 The use of a Falcon 9 carrier rocket is part of an agreement reached with SpaceX to certify the company for the access to military satellite launches. Elon Musk, SpaceX founder, wanted to go to court to get to be able to have a chance of getting a contract of that kind but now the parties are somewhat closer. For SpaceX, this was supposed to be the opportunity to make another attempt of a controlled landing of the first stage of the cFalcon 9 rocket, the one that acts as a booster in the lift off. The first attempt made a few weeks ago didn’t go very well and the booster crashed on the automated marine platform. The automated marine platform was given a name, “Just Read the Instructions”, like one of the starship of the Culture, the fictional universe in which Iain M. Banks set most of his science fiction novels. The writer passed away in 2013 and Elon Musk wanted to remember him with this tribute. Unfortunately, in the sea area where the booster had to land the weather was very bad, with heavy sea. The automated marine platform can remain stable but it has its limits and last night the storm was too bad. For this reason, SpaceX gave up trying a controlled landing and just tried a splash down. Despite the weather, the booster splashed down vertically 10 meters from its target. This effort will provide many new data to try a controlled landing on a future occasion. The DSCOVR satellite will reach the L1 area in about 110 days. After the test phase it will begin its primary mission, which will last two and a half years. NOAA and NASA will operate it together. The Earth’s images will be posted on the Internet, just as Al Gore, who was present at the launch, wanted.